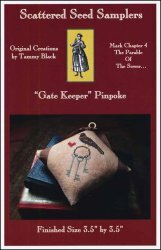 Gate Keeper Pinpoke [D7029] - $12.00 : Yarn Tree, Your wholesale source for cross stitch supplies. Cross stitch pattern by Scattered Seed Samplers. This pinpoke deisgn features a crow holding on to a keychain of keys. A heart is stitched by the crow. Stitch count 51w x 51h. Stitched on #8291 Zweigart Belfast Linen Light Mocha 32ct.